Yesterday was a weird one. It's hard to explain, but for reasons passing understanding, marking this one squarely in the win column is enough for me. It was hot, SMU was probably a little better than their national rankings say they were, players were cramping up like crazy, the refs were a mess and really helped SMU on a few drives, and there were a ton of timeouts and reviews which really stunted the flow of the game. 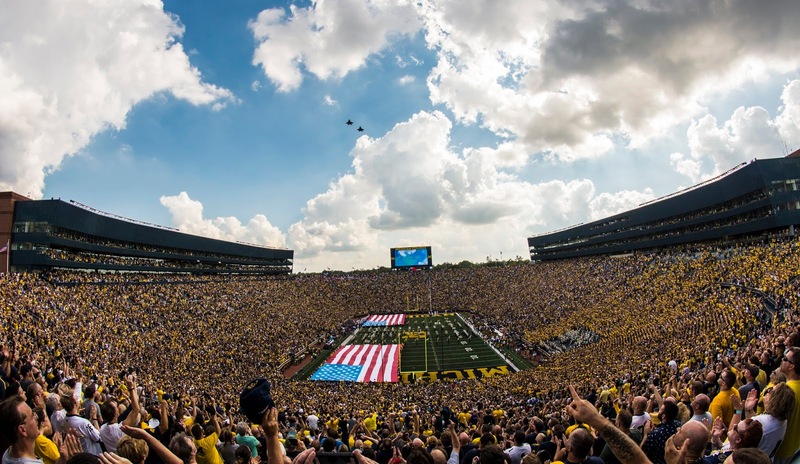 All in all, on a day when much of the Big Ten looked terrible, I'm just glad it's over and Michigan sent the Mustangs home with a 25-point loss. On paper, Michigan didn't do anything specifically great. It was clear from the start that Harbaugh wanted to run the ball and SMU wanted to stop the run. It was pretty slow going for the Michigan offense through much of the 1st half. With Karan Higdon out with an undisclosed lower body "tweak", the bulk of the carries fell to Chris Evans who finished the game with 85 yards on 18 carries. Not exactly big numbers against the 126th nationally ranked rushing defense. Freshman Tru Wilson also saw plenty of action with 53 yards on 11 carries and a touchdown. 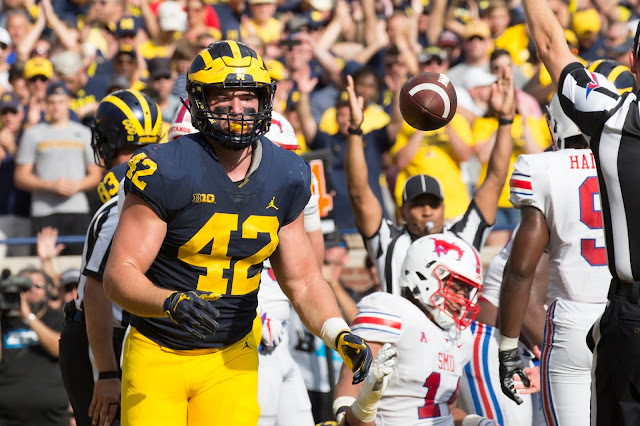 With the running game sputtering, Michigan looked to Shea Patterson and his many receiving targets to inject some life into the offensive attack. He did. Patterson was sharp all day, finishing with 237 yards on 14 of 18 passing with 3 touchdowns and 1 interception. All 3 of Shea's touchdowns were caught by Donovan Peoples-Jones who had a whale of a day. The OL struggled at times with SMU's linebacker blitzes, and pass protection was a little iffy as well...its clear that this current line is a work in progress and I wouldn't be surprised to see some guys shifting around and some more of the backups being given a chance to work through. Defensively, Michigan was pretty solid. Again, there were a few REALLY questionable pass interference calls that helped SMU a ton...especially in the second half. With a lot of guys cramping up out there, SMU was able to make some plays and extend some drives enough to really irk the Michigan faithful. One issue that's really emerging for Michigan is their inability to contain mobile quarterbacks and spread offenses. When William Brown came into the game in the second half, Michigan struggled to stop him from making plays...which doesn't bode well for the future as we look ahead to Michigan State, Penn State and Ohio State. Easy. Patterson to DPJ. That was the difference in the game yesterday. Shea only targeted DPJ 4 times but he caught all of them and 3 were for touchdowns. You have to be excited to see Patterson develop a solid go-to connection with one of his receivers and while he's very good at spreading it around to receivers and tight ends...its easy to see why DPJ is his favorite target. I want to say the refs were the worst of the game, but I don't like doing that here. But they really hurt Michigan at key times. Aside from the questionable calls that went against the Wolverines, the constant reviews and extended delays were brutal for those watching the game and I can only assume didn't help the Wolverines establish a flow and rhythm. Also making the worst list is what we just talked about...defending the option. 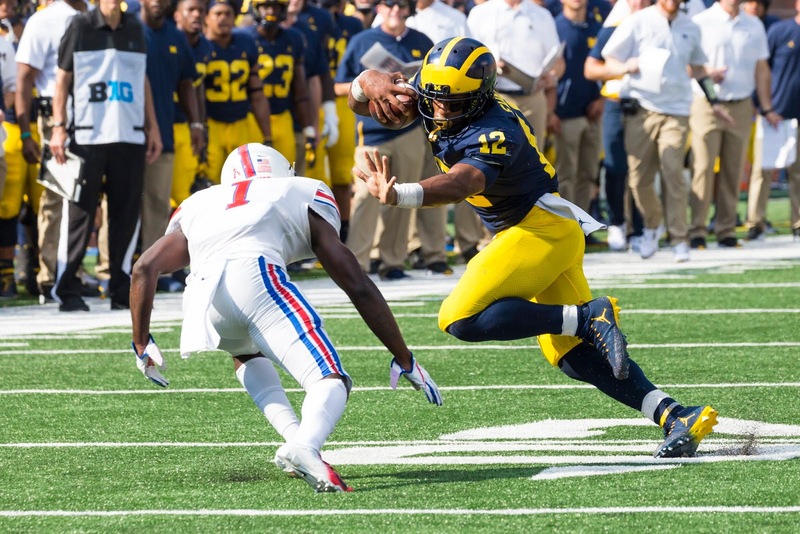 Good mobile quarterbacks are going to be a problem for this Michigan defense unless they can make huge strides in the next couple of coming weeks. Trace McSorley, Brian Lewerke and Dwayne Haskins are all playmaking QBs that have given Michigan's defense fits in the past. As I look down the schedule a bit, that's a huge concern. Had 4 catches for 90 yards, but 3 were for touchdowns and all came at good times when Michigan needed an offensive answer when the run game wasn't getting it done. He had a solid day (aside from his PI late in the 2Q). But clearly he gets the game ball thanks to his 73-yard pick 6 to end the half. SMU, down 14-7, was driving to at least attempt a field goal before the half. Metellus' INT was a huge play for Michigan to swing the momentum going into the half. Will was close to getting the game ball last week. He only punted twice, but his 50-yard average shouldn't go unnoticed. 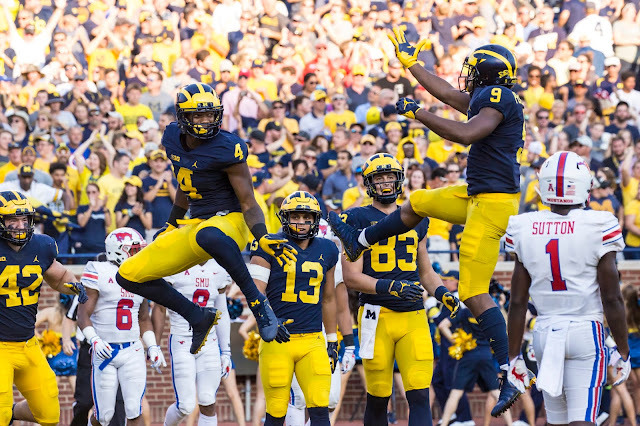 Punting was a little bit of an adventure last season, especially towards the end, but I can't safely say Michigan fixed that quickly with Hart this season. He's been exceptional. OK, the last thing I expected a year ago was that Jim McElwain would win a game ball as a Michigan assistant coach...but here we are. What can't I say? 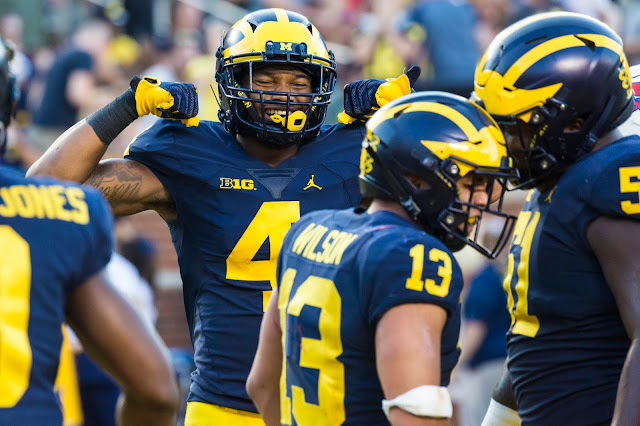 He's taken one of Michigan's worst producing groups a year ago (receivers) and made them one of the strengths of the team. Yeah, a lot of that has to do with the QB play, but there's no question receiver output has increased exponentially this season.